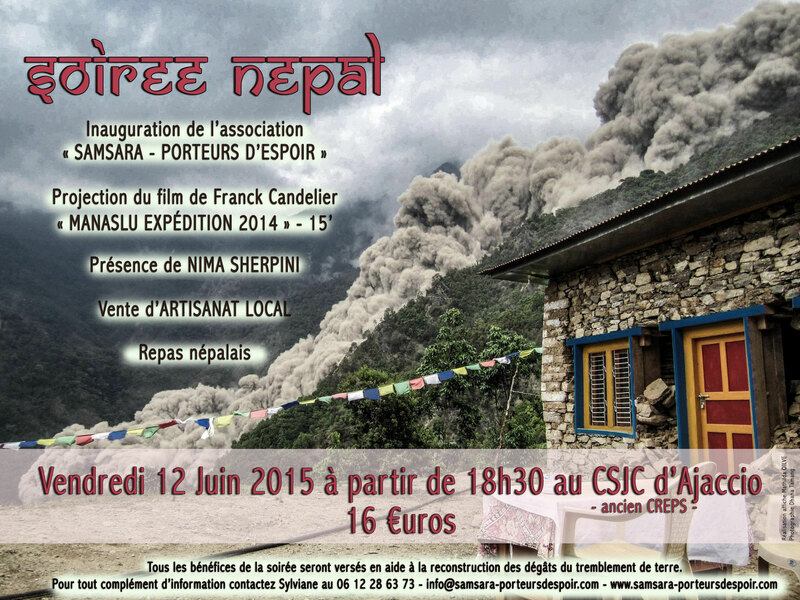 Au programme : l'inauguration officielle de l'association Samsara, la projection du film de l'ascension du Manaslu (8.163 m, huitième plus haut sommet du monde) de Franck Candelier, la présence unique de Nima Sherpini présentant les dernières actualités des dégâts des tremblement de terre, suivit d'un débat ouvert avec le public, mais aussi un diaporama photo et quelques vidéos présentant les destinataires des dons et le contexte des villageois par rapport aux récentes actualités. Le tout est agrémenté d'un délicieux repas népalais et de quelques collations. Venez nombreux ! afin que nous puissions améliorer les prochaines éditions. I am really impressed with your writing skills as well as with the layout on your blog. Is this a paid theme or did you modify it yourself? Anyway keep up the excellent quality writing, it is rare to see a great blog like this one nowadays. Today, while I was at work, my sister stole my apple ipad and tested to see if it can survive a 30 foot drop, just so she can be a youtube sensation. My iPad is now destroyed and she has 83 views. I know this is completely off topic but I had to share it with someone! I have been exploring for a bit for any high-quality articles or weblog posts on this kind of space . Exploring in Yahoo I finally stumbled upon this website. Reading this information So i am satisfied to show that I've a very just right uncanny feeling I discovered just what I needed. I such a lot surely will make certain to do not forget this website and provides it a glance on a relentless basis. Hello friends, fastidious paragraph and pleasant urging commented here, I am really enjoying by these. Nice post. I was checking constantly this blog and I'm impressed! Very useful info particularly the last part :) I care for such information a lot. I was seeking this certain info for a very long time. Thank you and best of luck. I think that what you posted made a great deal of sense. However, think about this, what if you were to create a killer title? I ain't suggesting your information is not solid., but what if you added a title that makes people want more? I mean %BLOG_TITLE% is a little vanilla. You could peek at Yahoo's home page and watch how they create news headlines to grab viewers to click. You might add a related video or a related picture or two to get readers excited about what you've written. In my opinion, it might make your posts a little livelier. Superb website you have here but I was curious if you knew of any user discussion forums that cover the same topics talked about in this article? I'd really love to be a part of community where I can get comments from other experienced individuals that share the same interest. If you have any suggestions, please let me know. Many thanks! If some one wishes to be updated with hottest technologies therefore he must be go to see this site and be up to date every day. I was curious if you ever considered changing the structure of your site? Its very well written; I love what youve got to say. But maybe you could a little more in the way of content so people could connect with it better. Youve got an awful lot of text for only having one or two images. Maybe you could space it out better? You can definitely see your expertise in the work you write. The world hopes for more passionate writers such as you who aren't afraid to say how they believe. Always follow your heart. Excellent web site you have here.. It's hard to find high quality writing like yours nowadays. I truly appreciate people like you! Take care!! Whats up very cool blog!! Man .. Beautiful .. Amazing .. I will bookmark your site and take the feeds also? I'm satisfied to find numerous useful information right here within the post, we need work out more techniques in this regard, thank you for sharing. . . . . . It is actually a nice and helpful piece of info. I'm satisfied that you just shared this useful info with us. Please stay us informed like this. Thank you for sharing. Hi to every body, it's my first pay a visit of this web site; this blog includes awesome and in fact excellent data for readers. Howdy! I could have sworn I've been to this blog before but after browsing through some of the post I realized it's new to me. Anyways, I'm definitely happy I found it and I'll be bookmarking and checking back often! Hi, I check your blog like every week. Your writing style is witty, keep up the good work! I just like the valuable information you provide for your articles. I will bookmark your weblog and test again here regularly. I am fairly sure I will learn many new stuff proper right here! Best of luck for the next!